Winding its way from Switzerland to the North Sea, the Rhine River has historically stood as a natural barrier defending the German heartland that lies beyond it. Since the days of the Roman Empire, the river's cold, wide and swift waters have proven to be a formidable obstacle to any aggressor intending to cross it. These facts were well known to the Allied commanders as their forces continued their assault toward the German interior in March 1945. The crossing of the Rhine would be a difficult and costly task. As the Allied armies approached, Hitler ordered the destruction of all the bridges that spanned the Rhine. By March 7, they all had been, except one - the Ludendorff railroad bridge at the little resort town of Remagen a few miles to the southeast of Cologne. On that day Lady Luck smiled on the Allies. At about 1 PM an American reconnaissance patrol reached the wooded hills overlooking the river at Remagen, and to their surprise, discovered the bridge still intact. Then the race began. The Americans quickly launched a full-scale assault on the bridge while the defending Germans scrambled to detonate the explosive charges that had been set to destroy it. The fighting was fierce as both sides realized what was at stake. The American soldiers scrambled under withering gun fire from girder to girder returning fire and ripping the explosives from the bridge's super structure. The German's were successful in detonating some explosives - but not enough to destroy the bridge. By 4 PM - approximately four minutes after the assault began - the Americans had reached the other side of the river and secured the bridge. When informed, 1st Army commander Omar Bradley responded: "Hot dog . . .this will bust 'em wide open. Shove everything you can across!" "While we were running across the bridge. . . I spotted this lieutenant, standing out there completely exposed to the machine gun fire that was pretty heavy by this time. He was cutting wires and kicking the German demolition charges off the bridge with his feet!" "On beyond the four towers of the Apollinariskirche that glistened in a light drizzle of rain they saw Remagen’s 400-yard-long, three-span bridge across the Rhine. The bridge ran to the village of Erpel on the east bank and across it lay two railroad tracks. Other American forces had come up against the same sort of thing before, but always, as they came to the Rhine crossings, the bridges went up in great explosions before their eyes, set off by German demolition engineers. Traffic was still moving across the Ludendorf Bridge. On the other side locomotives puffed, awaiting orders to pull out. 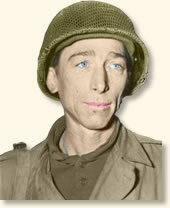 Lt. Col. Leonard Engemann of Minneapolis, in command of a reconnaissance party, was determined to save this bridge if it was at all possible. So, at 3:50 o’clock, a platoon led by Lieut. Emmett Burrows of New York City, sped down the slope to the bridge entrance. There was a flurry of shooting as the Germans, taken completely by surprise, scurried about trying to organize a defense. A German gun was knocked out, some German soldiers killed. Then the Yanks, crouching low against machine gun fire coming from the bridge towers, ran out onto the bridge. Just as they stepped on the span, an explosion occurred three-quarters of the way down the bridge. The Germans were setting off demolition charges, and the men thought surely their chance was gone. But no, only slight damage was done. They raced on. Sgt. Alexander A. Drabik, a tall, lanky former butcher from Holland, Ohio, was the first American across the Rhine, the first invader to reach its east bank since the time of Napoleon. But he wanted all the honors passed on to a young lieutenant of the engineers, John W. Mitchell of Pittsburgh. Soon the bridge was swarming with Americans, while Mitchell, joined now by other engineers, cut and jerked out wires leading to dynamite charges. Gingerly they detached detonators and lifted boxes of explosives from the piers. Later, from prisoners, the Americans learned that the Germans planned to blow up the span at precisely four o’clock. But the German officer assigned the demolition job was drunk when the American tanks reached Remagen. This officer, a lieutenant, had gone into the town of Eprel as the Yanks approached and spread the word boastfully that ‘the bridge goes up at four o’clock this afternoon. German soldiers and civilians, gathering from miles around, were sitting in ‘grandstand’ seats at every vantage point on the east bank, waiting for the spectacular event to come off, when Burrows’ patrol ran onto the bridge – ten minutes before the hour fixed for its destruction. The German lieutenant signaled the plunger down. Two small explosions occurred, but the bridge only shuddered and remained standing. Several of the fuses had been faulty. . . .By nightfall scores of tanks, trucks by the hundreds were moving up and across the Rhine. All roads leading to Remagen were packed with American troops and trucks and armor and guns. Soldiers who had been ready to drop from fatigue stepped on the accelerator, broad grins splitting their begrimed faces. The Ludendorf bridge had become a one-way street, east-bound." This eye-witness account appears in Holles, Everett, Unconditional Surrender (1945); Hechler, Karl, The Bridge at Remagen (1957); Turner, Barry, Countdown to Victory (2004). "Capturing the Bridge at Remagen, 1945," EyeWitness to History, www.eyewitnesstohistory.com (2008). 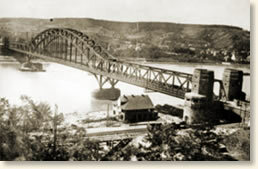 The Germans built the Ludendorff Bridge in 1918. It was named after Field Marshall Ludendorff, Field Marshall of the German army at the time and later an ardent supporter of Hitler. The Germans mounted an attack to regain the bridge 48 hours after its capture. The attack was repelled. The bridge collapsed shortly after as a consequence of German artillery and air bombardment. In retaliation for the bridge's capture, Hitler ordered the execution of six officers involved in its defense. One escaped the sentence because he had been captured by the Americans.